Topmost Fall Foliage spots in and around Gatlinburg, Tennessee. Autumn, A period of change is a colorful season and people travel around the world just to see these wonderful looking fall colors and one such beautiful location is the Smoky Mountains or Gatlinburg. 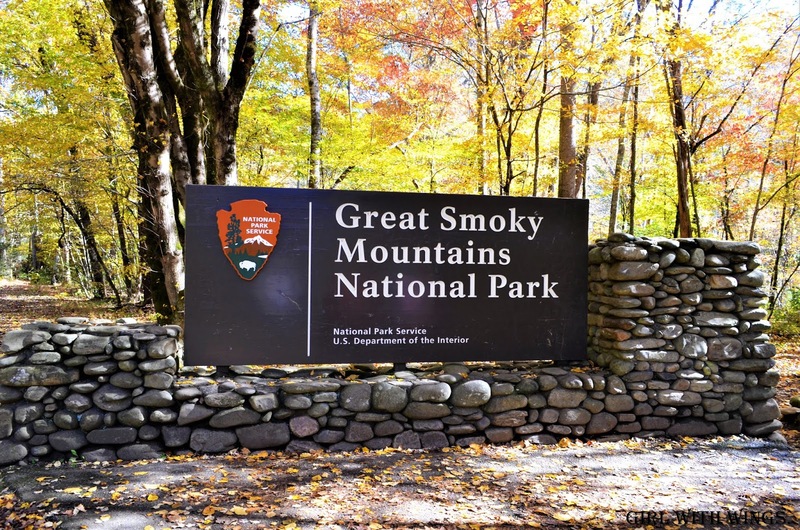 The smoky mountain which is a subrange of Appalachian mountains is one of the most gorgeous creations of mother nature. 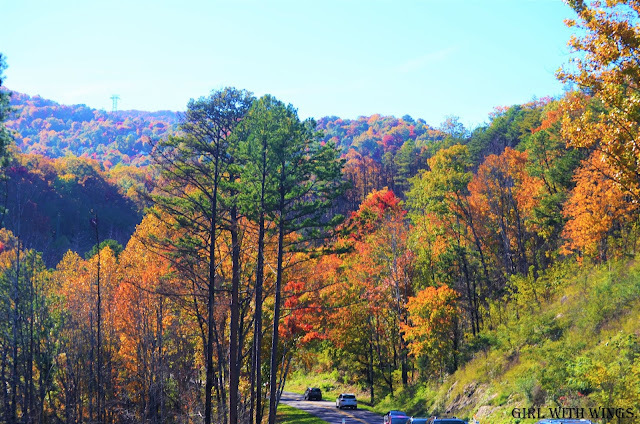 Going on a drive en route these scenic roads, exploring the lookout points, hiking trails are the most popular fall activities and if you are a private person and hate hustle bustle or overcrowded places then booking a private cabin is the best way to enjoy the fall foliage. When I say private cabin it means sipping on red wine with your loved ones while you view nature changes the colors from green to yellow, orange and red, isn't it amazing?? A sign designating the start of the Smoky Mountains. Clingmans Dome, A part of the Great Smoky Mountains is located at an elevation of 6,643 feet which is the highest point in Tennessee. Circular ramp located at the Clingmans Dome offers 360-degree panoramic views of the mountains. The 7-mile narrow yet scenic road you take to reach the observatory offers spectacular views of nature. So do not forget to stop by the viewpoints to enjoy the breeze, colors and click as many pictures as you need. 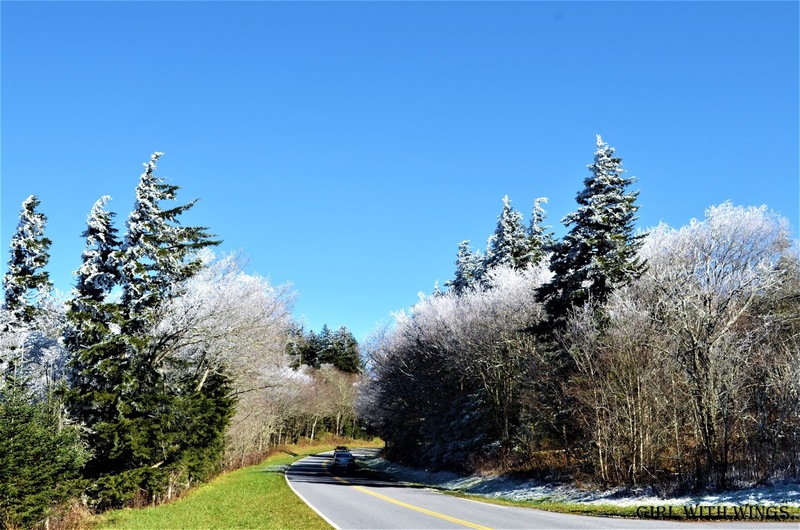 The sight of snow filled trees at Clingmans Dome. This beautifully paved scenic road is situated at an altitude of 5,046 feet and is minutes away from Clingmans Dome. Newfound Gap Road rather the land of blue smoke as described by Cherokees is one of the most popular drives in smoky mountains and offers huge and free parking space for the visitors. Tennessee and North Carolina Borderline. 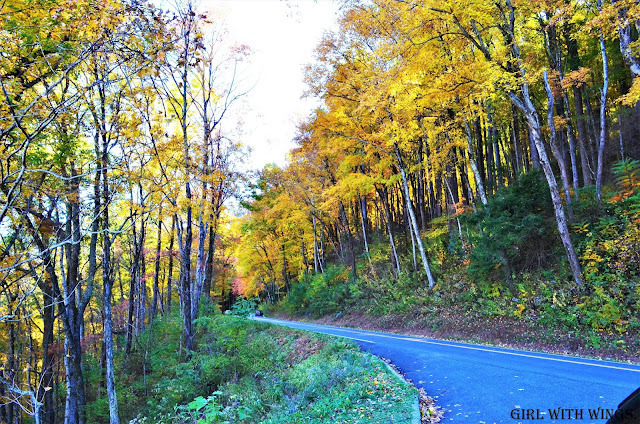 A glimpse of Newfound Gap scenic road. 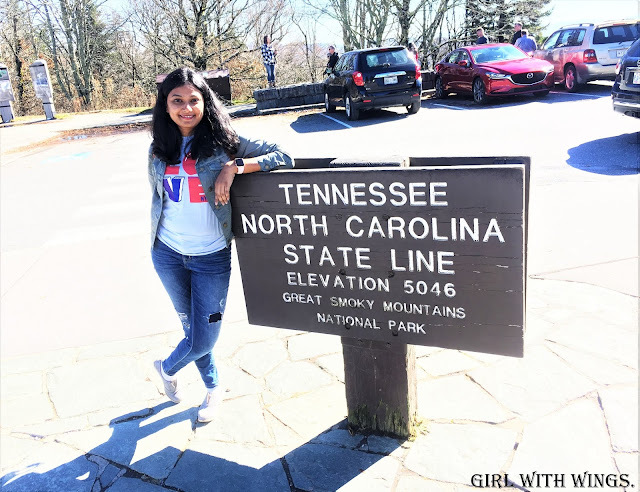 This place is also home to Rockefeller Memorial and apart from our 15-mile scenic drive and the magnificent views, I enjoyed discovering and taking a picture of mine while I stood on the state line or borderline of North Carolina and Tennessee states. The 2-mile trail to Chimney Tops starts from the Great Smoky Mountains National Park and is minutes away from Newfound Gap road. Despite the short distance, elevation and the ample number of stairs to reach the top makes it strenuous but then guys trust me it is worth it. I mean, multiple bridges, flowing water/river, trees and the colors you get to witness on Chimney Tops Hiking Trail are phenomenal. It provides limited parking so people make sure you reach early to capture the parking spot and do wear comfortable shoes and a thick jacket. Yet another beautifully paved road to witness fall foliage. 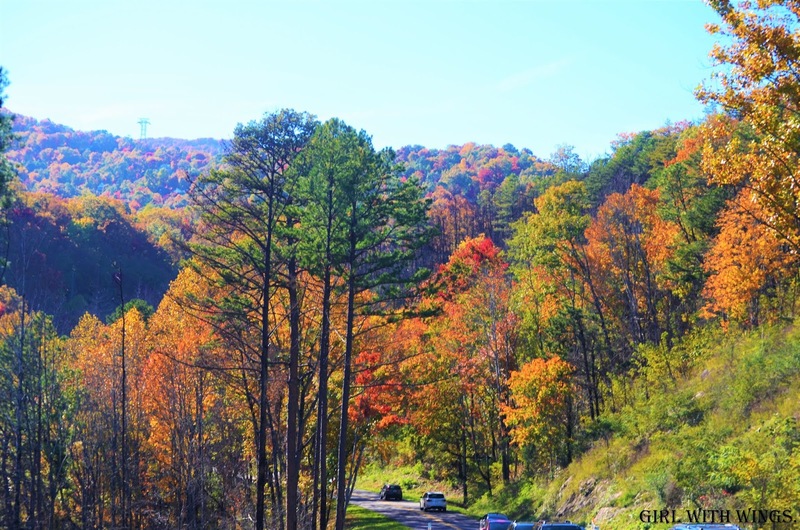 Gatlinburg is a small town nestled in the gorgeous mountains of Tennessee. This small town is filled with tourists around the world throughout the year. Just like downtowns of other cities, Gatlinburg downtown was filled with traffic so we parked our car at the hotel and walked towards our destination. Since Gatlinburg is a small town, every tourist spot in downtown is at a walkable distance. Despite the crowd, there was no wait time. Hopped on an open chair airlift basket as soon as we purchased the tickets and took off in no time. 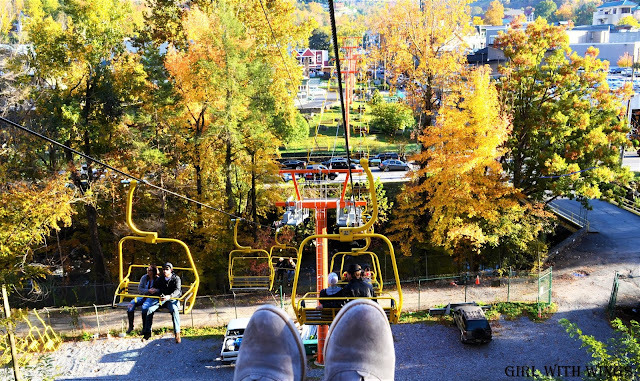 Skylift operated slowly so we could feel the breeze, move around and enjoy the 360-degree view of the fall colors. During our ride, we passed several buildings, houses, bridge, and river before we reached an ascent of 1800 feet. Though we had no access to the observatory at the top, the magnanimous view of the mountains I got to see during my descend journey is unbelievable. Entry Fee: 16$ for adult and 13$ for a kid. View from my sky lift chair before landing. Space Needle is an all steel observatory building located 407 feet above the ground level. We reached the top of outdoor observatory through one of the two glass elevators offered by tower management. The panoramic view of the Smokies and the fall colors were one of the most beautiful things I have ever seen during this fall season. Entry Fee: 12.95$ for adult and 7.95$ for a kid. Sri Someswara temple or as popularly known as Mt Soma is a serene Hindu temple nestled in blue ridge mountains. This Vedic temple is open 7 days a week and offers meditation hall, food and stay. 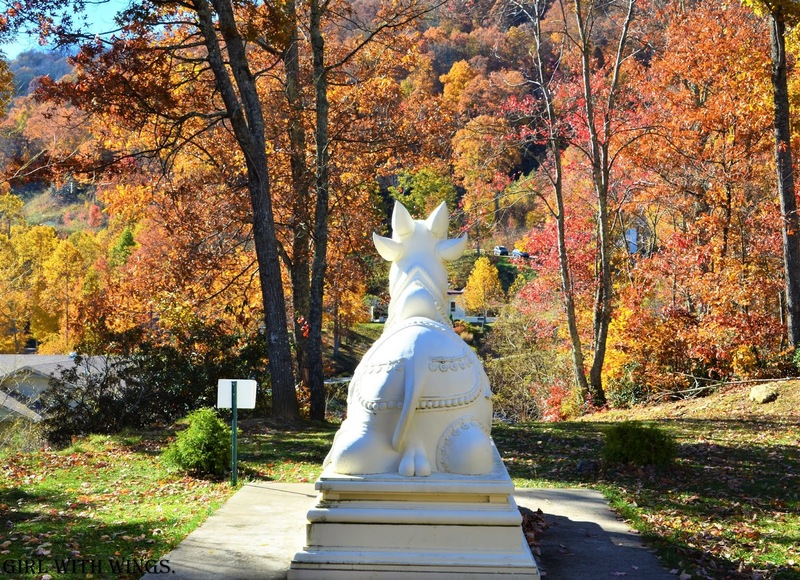 Alike the temple, 1 hour 30 minutes drive from Gatlinburg to Mt Soma is equally beautiful and driving across these mountains is a treat for all generations. You get to see the various intensity of fall colors as you drive across. Apart from magnanimous scenic views, colors, steep concrete roads, you get to experience the countryside charm. I mean even during this age and generation especially in developed countries like America there are people who love to live organically. The view of the gorgeous mountains, peaceful temple, colorful leaves, cattle and the horses running around the huge farms was just insanely incredible. Beautiful capture of Nandi facing lord Shiva at Mt Someswara temple. Cades Cove is an 11-mile one-way scenic loop, This loop offers great picturesque views. You can experience the views of mountains, vibrating colors, variations of trees, fog and all at your own pace but be mindful of other travelers. People who drove before us stopped their car in the middle of the road to take a picture and that caused a traffic rucksack to fellow travelers. So, guys, you have the freedom to view and appreciate every bit of nature and at your own pace but then use pullouts instead of stopping at the middle of the roads. 1. These famous spots are crowded during the fall so be prepared for traffic. In fact, I suggest people pack lunch/snack so you can stay energetic. 2. Be mindful of fellow travelers and use pullouts. 3. Because of the elevations, weather is usually cold along with a chance snowing so wear warm, comfortable clothes.